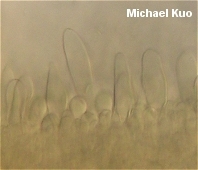 Growth under conifers (rarely birch) in boggy areas, often in sphagnum. A strong curry-like or burned maple syrup odor (especially pronounced on drying). 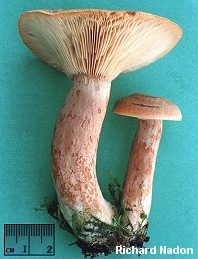 A long stem (usually over 5 cm) and a medium sized cap (3-13 cm). Brownish to orangish brown or pinkish brown colors on the cap and stem. Watery milk that does not stain the gills or flesh. Over the past few decades the recorded North American range of this species has increased substantially, and it appears to be present in most areas of the continent, with the exception of the southwest and the West Coast. 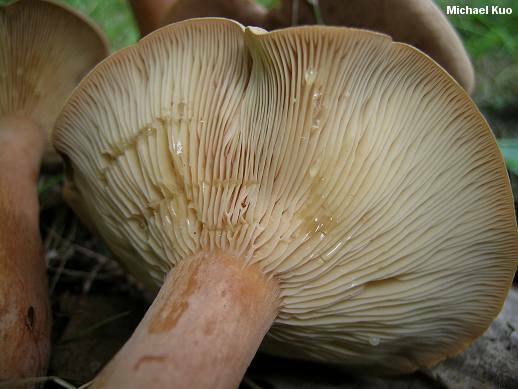 North American field guides call this mushroom "Lactarius aquifluus," and often mention the name Lactarius helvus as an outdated, quaint synonym. But European researchers (without the support of DNA evidence) have synonymized the names--and the only reason "Lactarius aquifluus" has been preferred by North American authors is that someone along the line couldn't read Latin; see the details below if you care. 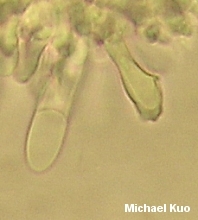 Ecology: Mycorrhizal with conifers (rarely with birch) in boggy, wet locations; usually growing in sphagnum; summer and fall; widely distributed and fairly common in northeastern North America from Nova Scotia to Minnesota, but also documented in the southern Appalachians, Texas, Montana, and Idaho. Cap: 3-13 cm; convex with an inrolled margin when young, becoming broadly convex, flat, or shallowly depressed, with an even margin; dry; smooth or finely velvety at first, becoming rough or sub-scaly; somewhat variable in color but usually some version of light brown. 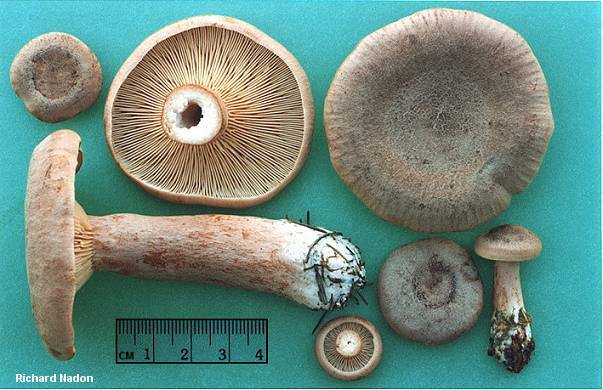 Gills: Attached to the stem or beginning to run down it; close; not infrequently forked near the stem; whitish at first, becoming dirty yellowish as the spores mature but not spotting or staining. Stem: 3-10 cm long; up to 2 cm thick; more or less equal; dry; smooth or very finely velvety when young; without potholes but sometimes with watery spots; very variable in color but frequently orangish, pinkish, or orangish brown; usually with a thin whitish bloom and thus darker where handled (though not actually bruising). Flesh: Pale pinkish or pale brownish, becoming dingy with age but not staining on exposure. Milk: Scant; watery; not staining tissues. Odor and Taste: Odor (of mature specimens, or on drying) strongly of curry or burned maple syrup; taste mild or slowly, slightly acrid. Spore Print: Creamy white to pale orangish yellow. 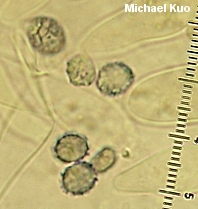 Microscopic Features: Spores 6-9 x 5-7.5 µ; broadly ellipsoid; ornamentation up to 1 µ high, as amyloid spines and ridges that form nearly complete reticula. 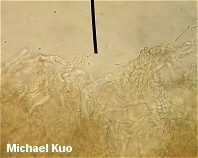 Pleuromacrocystidia abundant and easily demonstrated on young specimens but often collapsing after sporulation; subcylindric to subclavate or subfusiform; up to about 70 x 12 µ. Cheilocystidia abundant; cylindric to subclavate; frequently septate and/or with slightly encrusted, thick-walled apices. 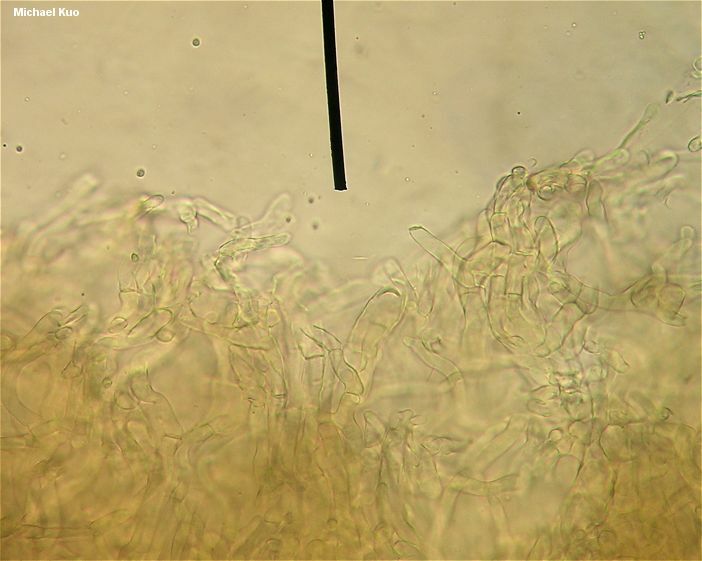 Pileipellis a dense tangle of repent and erect hyaline hyphae 5-10 µ wide. REFERENCES: (Fries, 1821) Fries, 1838. (Saccardo, 1887; Coker, 1918; Kauffman, 1918; Hesler & Smith, 1979; Smith, Smith & Weber, 1979; Phillips, 1991/2005; Lincoff, 1992; Metzler & Metzler, 1992; Heilmann-Clausen et al., 1998; Roody, 2003; McNeil, 2006; Miller & Miller, 2006.) Herb. Kuo 09159701, 09120507. Hesler & Smith (1979) use the name "Lactarius aquifluus" (which comes from a New York collection named by Peck in 1876) for this mushroom, shying away from the older European name Lactarius helvus: "We finally decided to recognize Peck's name because the Friesian descriptions (1821, 1838) clearly indicate an acrid taste and a milk-like latex . . . This combination is consistently contradicted by the North American collections." But Hesler & Smith obviously didn't read Fries's 1821 description, despite citing it, since Fries wrote: "sapor acris, lac album immutabile; sed variat mitis, lacte aqueo, non colorato" (I translate this as "taste acrid, latex white unchanging; but varying to mild, latex watery, not colored"). Perhaps Hesler & Smith stopped reading at the semicolon, but Fries obviously accounted for mild collections with watery latex--which takes away the only reason for using Peck's name. 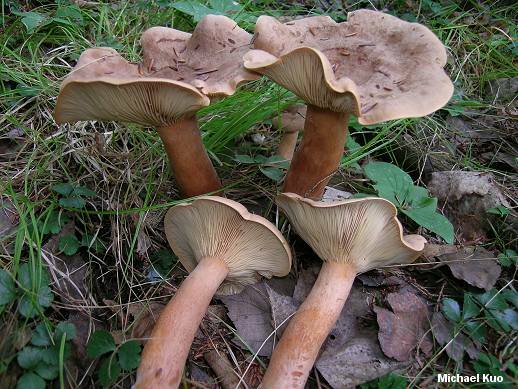 European researchers (Heilmann-Clausen and collaborators, 1998) treat Lactarius aquifluus as a synonym of Lactarius helvus--though they do so without the support of molecular evidence. Ironically, if molecular data were to support genetic separation of a North American species (which is entirely likely, given what has happened so far), Lactarius aquifluus would probably represent the best name to use on our continent, despite being previously used for bad reasons.